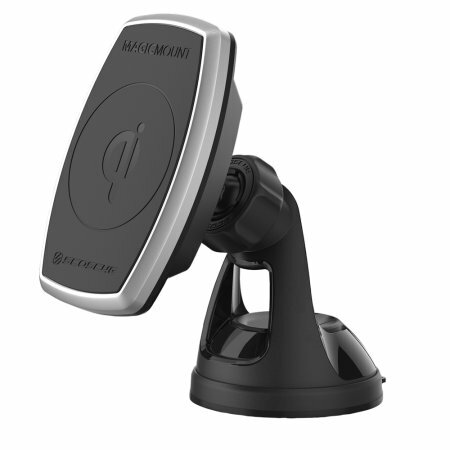 Combining the modern spectacle of wireless charging with ultra-fast speeds and a secure magnetic mounting system, the Scosche MagicMount Charge is the ideal way to mount and charge your Qi-compatible smartphone in your vehicle. Works well as advertised. I have not tried the suction mount. The dash stick on mount is too small to hold it well. The ball joint connection keeps comming loose and less stable than I had hoped. To be fair I have an iPhone 7plus in a Mophie juice air case which is quite a heavy case. I mounted it so the bottom of the case rests on a rubber pad to take the weight so the magnet only needs to hold lateral motion and it does this well as I do get a lot of vibration. The suction mount works great but as I wanted it on the dash I used the 3m fitting stuck down onto leather dash left 24 hours before use. The magnetic worked ok whilst using Apples leather case with the metal plate inside, but decided to stick the plate on the outside as I wasn’t confident it would stay in place on a bumpy road. My grip is the power cable way too short and should have come with a 3 metre of cable with a plug in fitting to assist hard wiring. I have a dash cam and this had 3m of cable and removable power cable. Unfortunately Scosche help is non existent as no reply’s to 2 emails. Resolution purchased cigarette lighter socket and created a power supply near the fitting. 1&1/2 foot come on Scosche how could that be used on the windscreens mount!